Medical treatment in symptomatic patients with hypertrophic obstructive cardiomyopathy aims to reduce the outflow tract gradients, and to improve diastolic dysfunction and rhythm disorders. Surgical myectomy is the standard treatment in patients with drug refractory symptoms. Since the early 1990s, dual-chamber (DDD)-pacemaker implantation and percutaneous transluminal septal myocardial ablation by alcohol-induced septal branch occlusion have widened treatment options in this subgroup of patients. An overview of medical and interventional treatment is presented. Hypertrophic obstructive cardiomyopathy (HOCM) was described in the late 1950s as a new entity of myocardial hypertrophy with dynamic left ventricular outflow tract obstruction. Hypertrophic cardiomyopathy (HCM), in the meantime, was described as a disease of the sarcomere [1,2]. Up to now, 10 loci of mutations have been found. Obstruction is mainly seen in the subaortic region associated with a systolic movement of the mitral valve apparatus, and about 5% of the patients present mid-cavitary obstruction . Typical symptoms are dyspnea, angina pectoris, stress-induced syncope, and increased risk for sudden cardiac death in some patients. HOCM is the most frequent cause of exertional syncope or sudden cardiac death in younger patients (<30 years) . Treatment of symptomatic patients with HOCM aims to improve functional disability, to reduce the extent of the outflow tract obstruction, and to improve diastolic filling. Furthermore, treatment of arrhythmias and prophylaxis of bacterial endocarditis must be considered. Administration of negatively inotropic drugs is the treatment of first choice, but up to 10% of patients with marked outflow tract obstruction have severe symptoms unresponsive to medical therapy . Only in this group may a more interventional approach be considered in order to improve hemodynamic function and clinical status. A direct comparison of medical treatment and percutaneous septal ablation, which was primarily performed in 1995 , has therefore not been performed up to now. The reported number of drug-refractory patients may be influenced by referral bias. Where patients are referred for interventional treatment in our own group, about two-thirds require active treatment either by alcohol ablation or surgical myectomy, whereas modification of medical treatment results in symptomatic improvement in one-third of the patients. Negatively inotropic drugs (beta-blockers, calcium antagonists of verapamil type, disopyramid, and cibenzoline) are used to decrease outflow tract obstruction [6,7,8,9,10,11,12,13,14]. Outflow tract gradient reduction >50% at rest and provocation has been described by administration of verapamil [6,7,8]. This drug is the predominantly medical therapy of first choice in Germany, whereas Anglo-American colleagues are more restrictive due to the potential vasodilating effect of calcium anatagonists that may lead to an increase of the outflow tract gradient. Pulmonary edema and sudden death have been described . Therefore, verapamil should only be used with short-term echoardiographic monitoring of outflow tract gradient. Verapamil has been proved to improve left ventricular filling properties in patients with predominant diastolic dysfunction . Personal observations with induction of high-grade atrioventricular (AV) blocks after verapamil treatment underline the importance of rhythmogenic monitoring. Administration of beta-blockers reduces left ventricular outflow tract obstruction [9,10,11], and they have a special effect in patients with latent obstruction (eg low resting and high provocable gradients). Beta-blockers should especially be the drug of first choice in patients with additional coronary artery disease. Anglo-American authors prefer disopyramid, a class 1A anti-arrhythmic drug, in doses up to 800 mg/day [1,12, 13]. Anticholinergic side effects especially limit the use of hemodynamically effective doses. Another limitation is the decrease of hemodynamic benefit by time. German colleagues are restrictive in administration of disopyramid due to the reported pro-arrhythmogenic side effect of class I anti-arrhythmic drugs in patients with coronary artery disease. Limited experiences exist with the use of another class I anti-arrhythmic drug, cibenzoline, a further restriction of which is limited availability . In symptomatic patients with hypertrophic cardiomyopathy without outflow tract gradient at rest and provocation afterload, reduction with angiotensin-converting enzyme inhibitors may improve clinical symptoms. But echocardiographic monitoring is required to exclude development of obstruction at long-term afterload reduction. Patients with hypertrophic cardiomyopathy and atrial fibrillation generally require anticoagulation for preventing embolic events. Cardioversion and preservation of sinus rhythm after successful cardioversion is predominantly performed with administration of amiodarone, the positive effects of which in patients with ventricular tachycardia are well described . An actual observational study discussed the possible positive effect of implantation of a defibrillator in this subgroup . HOCM carries increased risk of endocarditis and requires standard prophylaxis according to the guidelines of cardiac societies. Although >50% of patients with the non-obstructive form of HCM have morphologic changes of the mitral valve apparatus , this group of patients seems to carry no increased risk of endocarditis during long-term observational studies so prophylaxis seems not to be required in this condition . An important number of patients with HOCM suffer from clinical symptoms like dyspnea, angina, and exercise-induced syncope despite intensive anti-obstructive medical treatment. Furthermore, long-lasting disease increases the risk of atrial fibrillation, with its negative impact on clinical symptoms and potential embolic events. Outflow tract gradient reduction should be achieved in this group of patients via a more active treatment. Because of the favorable hemodynamic and clinical results of surgical myectomy [19,20,21,22], with its increased surgical risk, a percutaneous approach of reduction of hypertrophied septal muscle bulge by induction of a localized septal infarction was considered in the late 1980s. An alcohol-induced septal branch ablation procedure had already been described at that time as a therapy of ventricular tachycardia . Sigwart was the first to report successful non-surgical myocardial reduction after occlusion of the septal branch using 96% alcohol in three patients . Several modifications of the ablation technique aim to improve the identification of the target septal branch with optimization of the hemodynamic effect and reduction of complications [24,25,26]. Alcohol ablation is performed by injection of 2-4 ml absolute alcohol in the target septal branch. Identification of the septal branch by myocardial contrast echocardiography turned out to be the standard technique. One to two milliliters of echo contrast medium (Levovist®, Schering, Berlin, Germany) were administered prior to alcohol injection through the central lumen of the balloon catheter under color Doppler echocardiographic monitoring. Injection into the optimal septal branch leads to complete coverage of the echo contrast marked septal area, on the one hand, and of the color Doppler estimated area of maximal flow acceleration as well as the area of systolic anterior movement of the mitral valve (SAM) septal contact on the other, without opacification of any other cardiac structure. The amount of injected alcohol depends on the acute hemodynamic effect and the echocardiographically estimated size of the contrasted septal area. Furthermore, the reflux of contrast medium (and thus of alcohol) into the left anterior descending coronary artery (LAD) should be excluded. This is of vital importance to avoid LAD damage and thus an infarction of the anterior wall. From the interventional standpoint, a slightly oversized balloon should be used and kept inflated 10 min after the last alcohol injection. Accepted indications for percutaneous transluminal septal myocardial ablation (PTSMA) are symptomatic patients classified as greater than New York Heart Association class III/Canadian Cardiovascular Society III despite drug therapy, or with important side effects of medication. Patients with less severe symptoms were only treated if they had high outflow tract gradients (≥ 50 mmHg at rest, or ≥ 30 mmHg at rest and 100 mmHg under stress) and documented high-risk factors for sudden cardiac death [3,6] or objective reduction of exercise capacity. It should be taken into consideration, however, that up to now only few data suggest that gradients have an impact on the risk for sudden death . Patients with previous but hemodynamically unsuccessful surgical myectomy or DDD-pacemaker implantation can also be treated. Patients with concomitant cardiac diseases indicating surgery, for example extensive coronary artery disease, valvular disease, and morphologic changes of the mitral valve as well as papillary muscle responsible for gradient formation or mitral regurgitation, should not be treated interventionally. Furthermore, hypertrophic cardiomyopathy without resting, as well as provocable outflow tract gradient, is a clear contraindication for PTSMA. Alcohol should not be injected in the presence of echocardiographically failed identification of a target septal branch, opacification of any cardiac structure other than the target septal area by echo contrast media, and unstable balloon position with risk of alcohol reflux during injection. Outflow tract gradient reduction can be acutely achieved in about 90% of the patients. Because of post-ablation remodeling and further shrinkage of the ablated area, it is not necessary to abolish the gradient. Further gradient reduction can be observed in >50% of the treated patients. The outflow tract gradient reduction lasts at least 1 year. The prerequisite for this remodeling is optimization of the alcohol depot in size and location, which results in smaller infarct size, probably with reduced risk of late left ventricular dilatation, and reduced complication rates. The author's experiences have shown that this optimization can be achieved using an echo contrast guided approach that reduced the need for pacemaker implantation due to postinterventional trifascicular block from 17 to 5% . The in-hospital mortality of 1.1% in our group is comparable with surgical results. Mortality rates up to 3.5% have, however, been reported . As in myectomy, elderly patients and patients with functional class IV showed increased risk of postinterventional complication [30,31]. This finding should result in an improved and prolonged postinterventional monitoring in this group of patients. Further reported complications such as dissections of the LAD or necrosis of other than the septal area underline the importance of an experienced interventionalist and echocardiographer who is able to interpret the on-line echo contrast studies. Clinical and hemodynamic follow-up studies for up to 4 years have shown no increased risk of sudden death or rhythmogenic complications [32,33]. Furthermore, septal perforation has not been reported during follow-up. The most important finding is the ongoing symptomatic improvement of the treated patients, which is proved by objective measurements during exercise tests . Measurements of diastolic function have shown improvement of this second hemodynamic consequence of the disease . The most important finding from the hemodynamic standpoint is the continuing and increasing reduction of the left ventricular outflow tract gradients (Figure 1) . This reduction should be viewed as an expression of postinterventional remodeling following an induced septal infarction, analogous to the remodeling following acute myocardial infarction. These findings also underline our strategy to induce septal necrosis by alcohol ablation that, while sufficiently large, should be as small as possible. 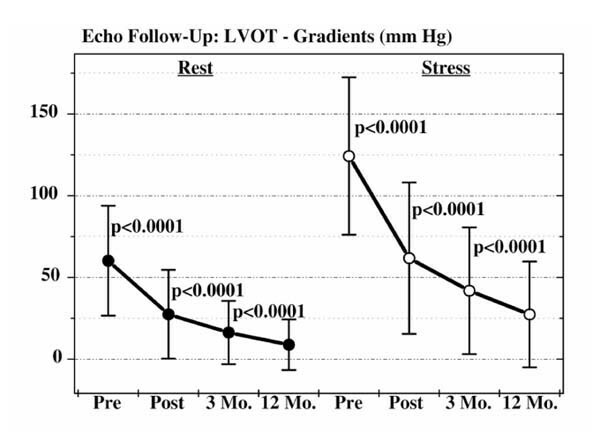 Left ventricular outflow tract (LVOT) gradients before (Pre), after (Post), and 3 and 12 months (Mo.) following percutaneous septal ablation in symptomatic patients with hypertrophic cardiomyopathy. Remodeling after PTSMA also results in reduction of both the ventricular septal thickness and the left ventricular posterior wall thickness [25,35]. Similar findings have been reported after surgical myectomy . Furthermore, some groups report reduction of both left ventricular end diastolic pressure and mean pulmonary arterial pressure [25,35]. The author's studies found a decrease of left atrial diameter  and maximal coronary blood flow estimated by positron-emission tomography (PET) investigations. Furthermore, most of the patients with abnormal blood pressure response at baseline showed normalization at 3 months. Only individual patients with HCM and mid-ventricular obstruction have been treated up to now. Especially, echocardiographic monitoring of PTSMA gives the opportunity to treat patients with this unfavorable anatomy for surgical myectomy. Differential indication for surgical and non-surgical myectomy should be worked out in the future by cooperation of all specialists involved in the field of HOCM. In summary, PTSMA is a promising treatment option in symptomatic patients refractory to medical treatment. Medical and interventional treatment are therefore complementary and not competing treatment options in patients with hypertrophic cardiomyopathy and obstruction. Possible complications and unknown long-term effects of PTSMA mandate careful patient selection. Furthermore, intraprocedural echocardiographic monitoring with optimization of the ablated septal area, reduction of peri-interventional complications, and improvement of acute as well as mid-term hemodynamic results is necessary for achieving optimal interventional results. Finally, restriction of PTSMA to few centers with large interventional experience and knowledge of this relatively rare disease is of outstanding importance.